I *might* have bought my own VHS copies as a teenager. I also *might* have bought myself a stuffed Bob and Larry. And my kids *might* own over half of the movies released in the past 21 years. 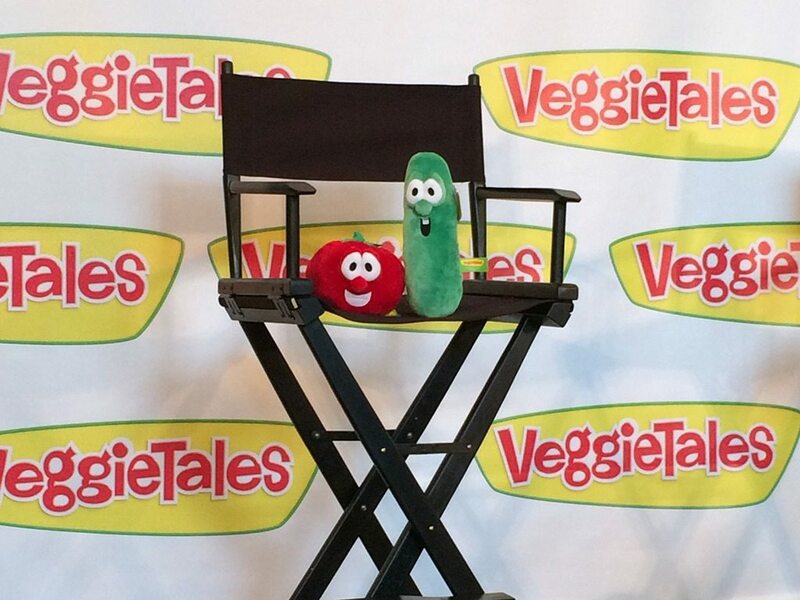 So, although I don’t usually participate in the Blogger Media Circuit, when I got an invitation to come to VeggieTales, it was clearly the occasion for rule-bending. I knew I must go. Whether, whether, whether, whether, whether you like it or not. Weather, weather, weather, weather, the weather was cold, warm or hot. 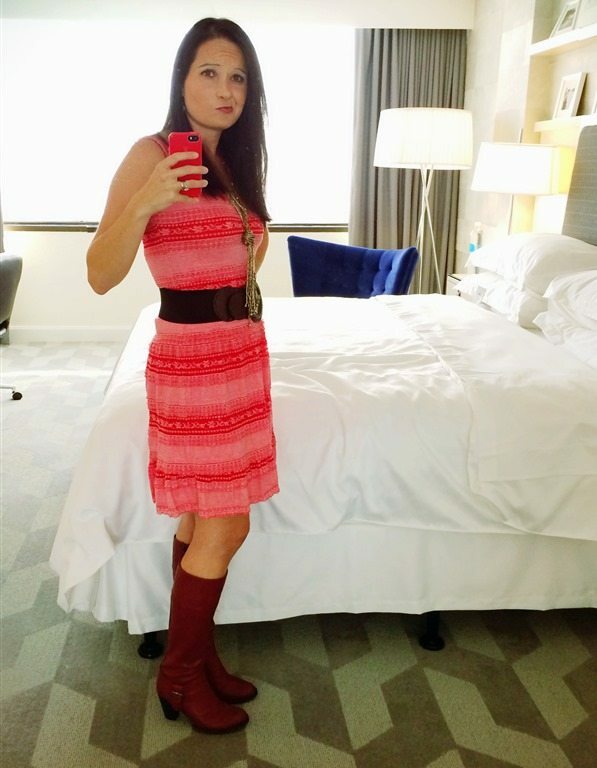 I packed my bags and arrived via Cebu in Nashville only to discover that in my haste I had accidentally brought the most Nashvillian outfit that I own. I looked like a freaking waitress. At at Honky Tonk. But I assumed it was A Lesson in Enduring Embarrassment and showed up anyway. Just like Junior Asparagus would do. After which I promptly ate Junior, and his best friend Laura Carrot. 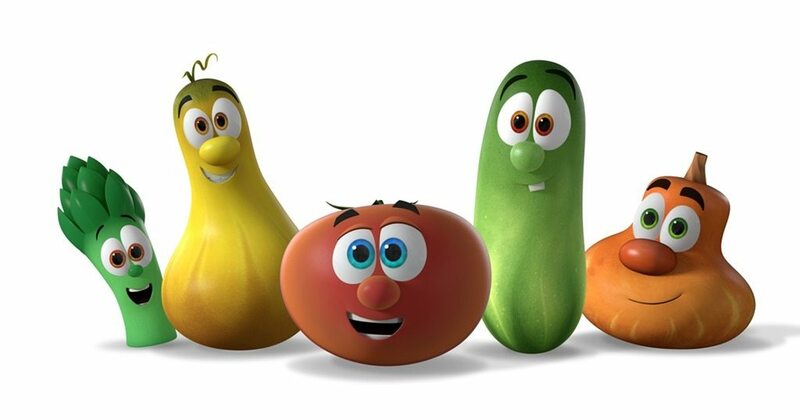 The fine people at Big Idea shared all sorts of exciting VeggieTales news with us, including letting us be the very first non-veggies to lay eyes on the newly imagined stars of “VeggieTales in the House”, the upcoming Netflix Series. I think they’re perfectly adorable. And they’re even better in action – but you’ll have to wait to see that for yourselves. The current plan is to release the first ten episodes Thanksgiving Weekend, so the kids and I are already planning on binge-Vegging rather than Black Friday Shopping. 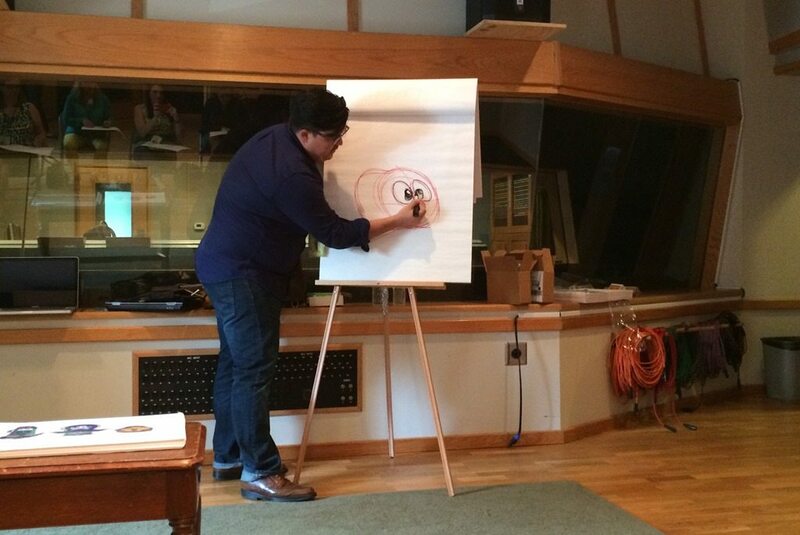 which Ali was totally jealous of since her favorite bonus features are the “How to Draw Bob and Larry” segments. But then when she saw how a sub-par my learning curve was, she forgave me out of pity. We had a Q&A session with Mike Nawrocki, the co-founder of VeggieTales and voice of Larry. I was doubly blessed when he sat next to me at lunch and even serenaded me with a few lines of Barbara Manatee – no greater a love song has ever been written. 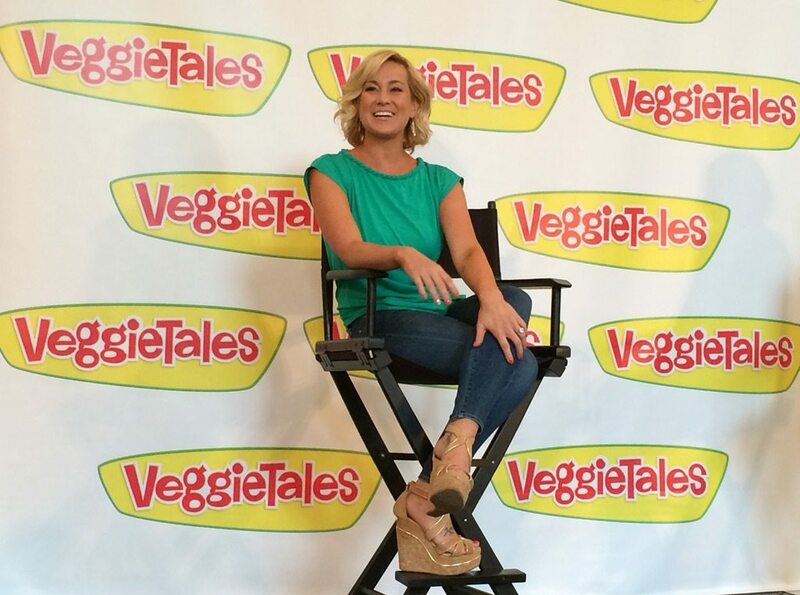 After lunch, we got to chat with Kellie Pickler, star of the upcoming Beauty and the Beet. She makes for a precious vegetable and human being. 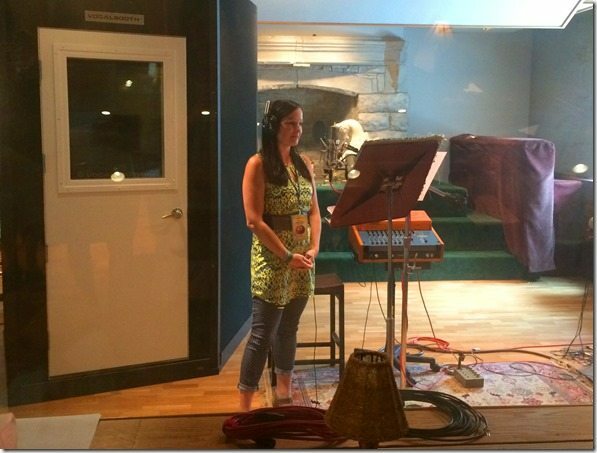 Aaaaaand….we were escorted individually into a sound booth to record a bit of Beauty in the Beet alongside her voice, which happens to nearly render my southern accent null and void in comparison. When I arrived back home, I tried to make it up to the kids by bringing them the just-released Celery Night Fever, which is a show about forgiveness, therefore attempting to subconsciously help them forgive their mother for hanging out with their favorite celebrities without them. Laura the Carrot’s character further reinforced to Ali the beauty in being Type-A, and she has carried around a checklist ever since, begging me for items that she could add to it. I brought Noah home his own Larry the Cucumber, since my teenage version of Larry is packed somewhere in a box of high school keepsakes. And since we haven’t had baths between my return home and the writing of this post, I can say with certainty that Larry has not left Noah’s presence in at least 72 hours. Between the two of them, they invented a game called “Larry Draws”, and apparently Larry does know how to draw because quite suddenly, Noah began coloring in the lines. Cucumbers are INSPIRATIONAL. And probably steal abandoned Pop Tarts when kids aren’t looking. Ali was also inspired, and showed up my previously exposed drawing skills with this portrait of Noah and his new best friend. The trip was fantastic, and I left with a newly revived vigor for all things veggie. 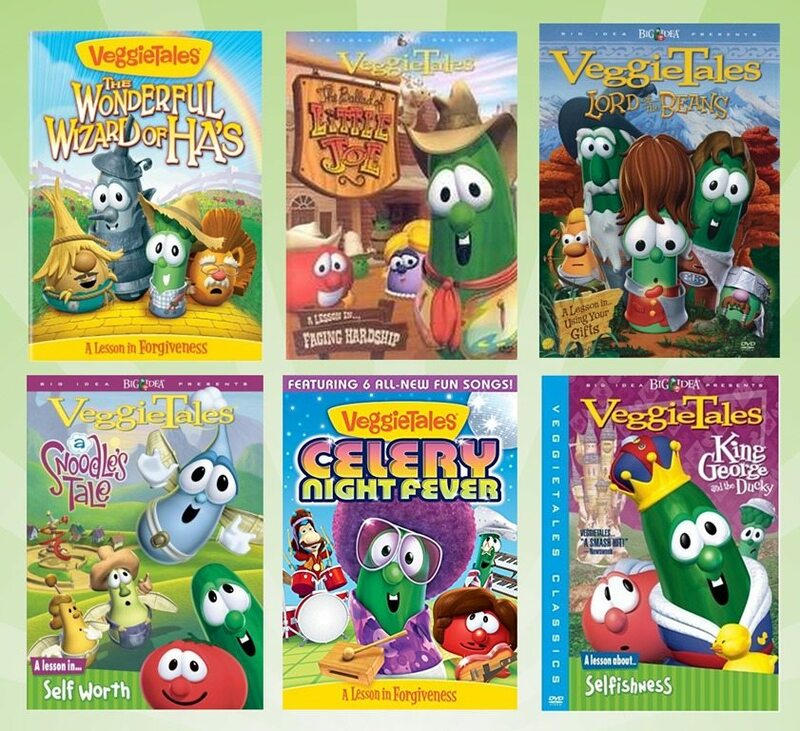 To celebrate, I went out and bought my six favorite VeggieTales movies to share with you guys! I love all of these for different reasons: The Wonderful Wizard of Ha’s and Lord of the Beans have unbelievably brilliant nods to the classics that inspired them, A Snoodles Tale makes me sniffle with joy every time I see it, Little Joe and King George are adorable and have great lessons that we all need reminded of, and Celery Night Fever, the newest release, is an always-needed reminder not to hold grudges – and has some dang catchy music. So. I will pick six winners and send you all one of the above DVDs (I’ll contact you to see which would be your preferences after I choose the winners.) To enter, just comment below and tell me your favorite VeggieTales movie. If you’ve never seen one, you can just tell me that, too. The contest is open until Monday, August 25, and I’ll announce the winners on my Giveaway Winners Page. 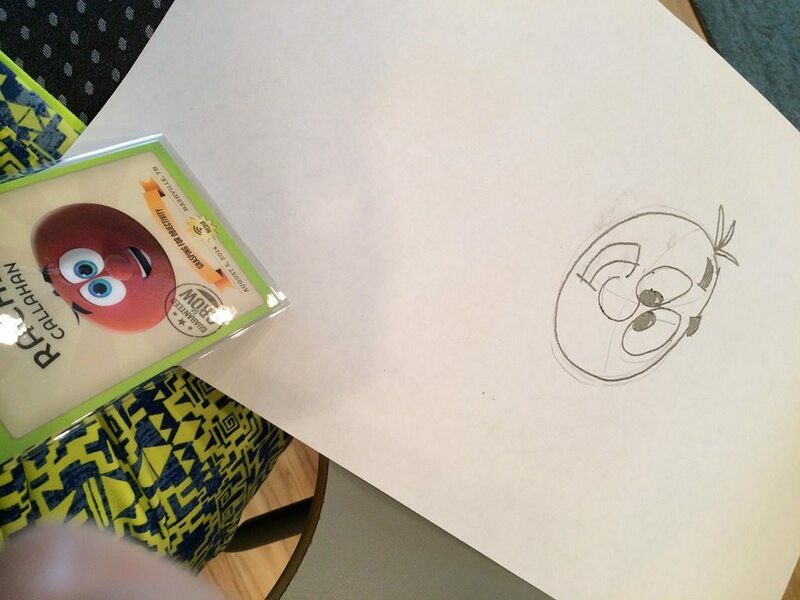 Disclaimer: I personally bought the prizes for this giveaway because I adore VeggieTales. My trip to Nashville was paid for by Dreamworks Entertainment but did not require a blog post or any other media services by me. All opinions are my own. And Junior Asparagus is my favorite, although now that I’ve actually met Larry, Junior does have competition. Next Post The Ticket to Preschool. Previous Post Why I Homeschool. My children have never watch Veggie Tales, but I think we should start! I remember 2 songs from my childhood days of Veggie Tales (unfortunately I don’t remember the episodes in full, only the lines from songs). and “The bunny, the bunny, oh I love the bunny. ps- I think you looked great in your outfit! Super cute boots! I always liked the Rack, Shack, and Benny one. That bunny song gets stuck in my head for days though. Not sure if that’s a blessing or a curse … but I still like the episode! I have always loved Veggie Tales! Such good messages in a way little kids can understand and adults can have fun with too. We used to love the song compilation video. Where is my Hairbrush? 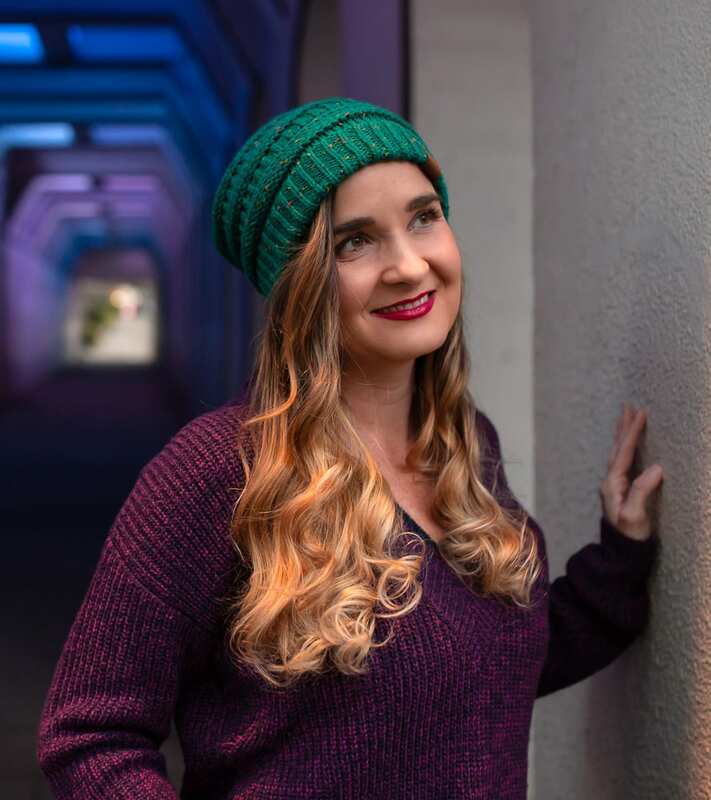 The Cheeseburger Song, Barbara Manatee, and the one about getting stung by a bee “right on the lip.” My kids are grown (youngest is 18) so I’m glad the Veggie Tales are still out there! Holy cucumbers! My kids – 12 to 7 LOVE, LOVE in a rather odd way all of the Veggie movies … thank u Wal-Mart for having them out there and my kids begging for each title… how do you say on to films about friendship and virtues? 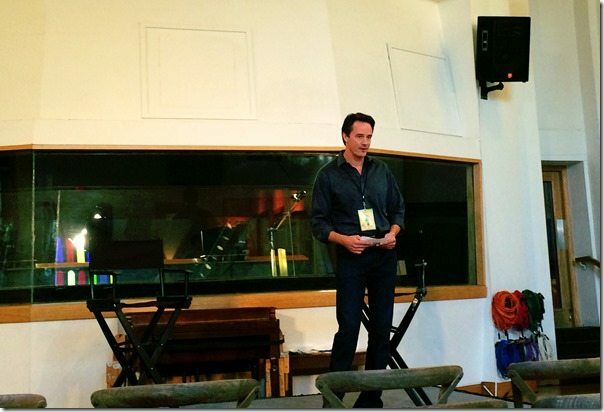 We ALSO have the music… and thank the good LORD that the kids have earphones. If I have to hear about hairbrushes and cebus for another year I will LOSE MY MIND. “What is a Cebu, anyway?” 2 M.Ed and I am quoting carrots. We also love the Bible video spin-off. We are Catholic, but I love how Phil includes that and never does anything to discriminate against any old Bible or religion. I am truly The Church Lady, though. I wield a fly swatter, though.. and my “perm” is not that tight…. LOL. We are dying for the new Celery… which only my hubby and I will get.. We can’t pull out that classic. I am still haunted by the jumping/bridge scene. And the Beet film sounds lovely! They had a TV show on Saturday’s a few years, ago. It ended, but was lovely. The eyes on the veg were slightly less creepy than these new “popping white” eyes. They obviously have either had too much coffee or are strictly vegan and juice everything… that’s what they say … vegans have sharp, large white clear eyes. Hmm… pass the bacon. Just sayin’ ……. Love your posts. My kids are cleaning and doing daily chores so they can flop. Mwwwwahhhh! All just to get their gold star and move their character up the weekly character / behavior chart. 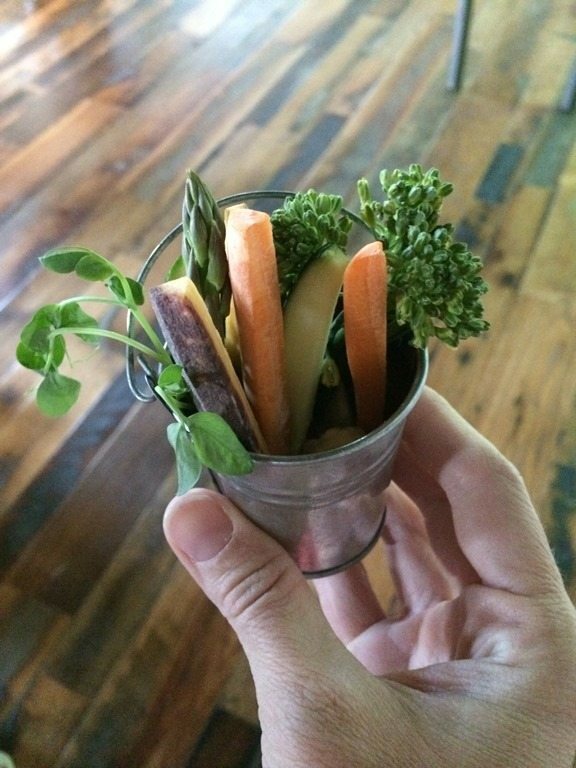 Well, of course we had the Veggie Tales around our house when our kids were little…and still do. Have the next generation coming around, ya know. We have loved them all. I’m going to be singing Veggie songs all day now. How about “God is bigger than the boogie man. He’s bigger than Godzilla or the monsters on TV.” You get the picture. 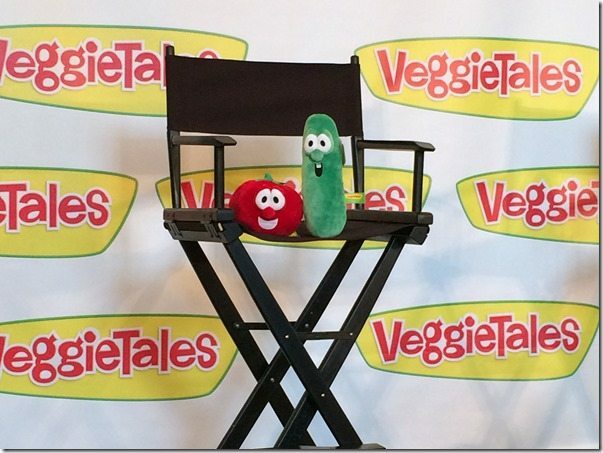 I don’t think I’ve ever been truly jealous of a blogger before, but VEGGIETALES? I’m jealous. I might need to rewatch some Veggie Tales myself. I’m partial to Madame Blueberry, just because it helped me understand Madame Bovary better once I got to high school. Quinn, however, LOVES the Christmas ones. And we watch them all year round. I think we’ll probably steal your idea of VT bingeing instead of Black Friday shopping. How fun! I bought the Easter one for Anderson last year & it’s kind of weird & he didn’t really like it BUT I remember how much my brothers LOVED Veggie Tales (ok & I loved them too) so I’m hoping to find some older videos to watch with him. My favorite one was the first one featuring Madame Blueberry! And of course I love the classic silly song with Larry “Oh Where Is My Hairbrush?”…*sigh* I may just go out & purchase a DVD right nowadays but I’ll hold out just in case I’m a winner! Thanks for doing such a fun giveaway! There is a very special place in my heart for Little Joe. Mostly because of the Boyz in the Sink song. Imagine if you will a group of 20 something missionaries in China singing that over and over and over again. My kids and I have always loved the Silly songs compilation video. Barbara Manatee is one of my favorites and the cheeseburger song I sing to my husband all the time. So, if Kelly Pickler married the Beet — guess that would make her a pickled beet! :-P I have to confess that I haven’t actually seen a Veggie Tales movie all the way through…only snippets here & there. Favorite song, though, would be The Pirates Who Don’t Do Anything. What a fun trip for you! I’d love to win because I feel we haven’t given Veggie Tales enough of a chance. We have one video, something about a blueberry, that we watched a couple of times when we were sick, but I don’t really remember it anymore. My son is 9 now and claims to be too sophisticated to appreciate talking vegetables, but I also have a baby daughter who might be more open-minded when she is old enough for videos. I’m so glad to find a safe space to share the fact that I sing Love my Lips, even after dropping my little one off at school. Our favorite movie is Lyle the kindly Viking, though my girly-girl still covers her eyes during the storm. My favorite is Veggies in Space: The Fennel Frontier. Love it! My 4 yo daughter’s is the League of Incredible Vegetables. Pick me! 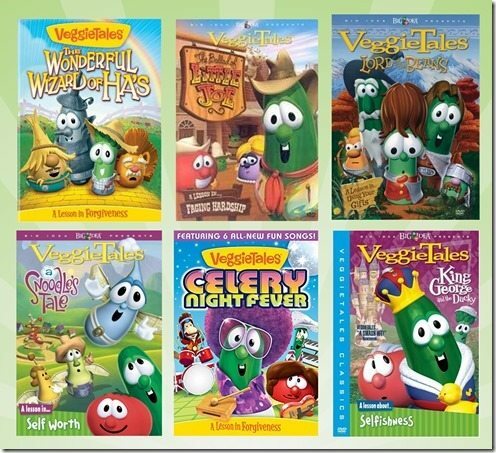 I love so many Veggie Tales movies that it is impossible to pick a favorite. My favorite character is Bob though. Or Junior. Or maybe Larry. I just love them all! Pick me!!! 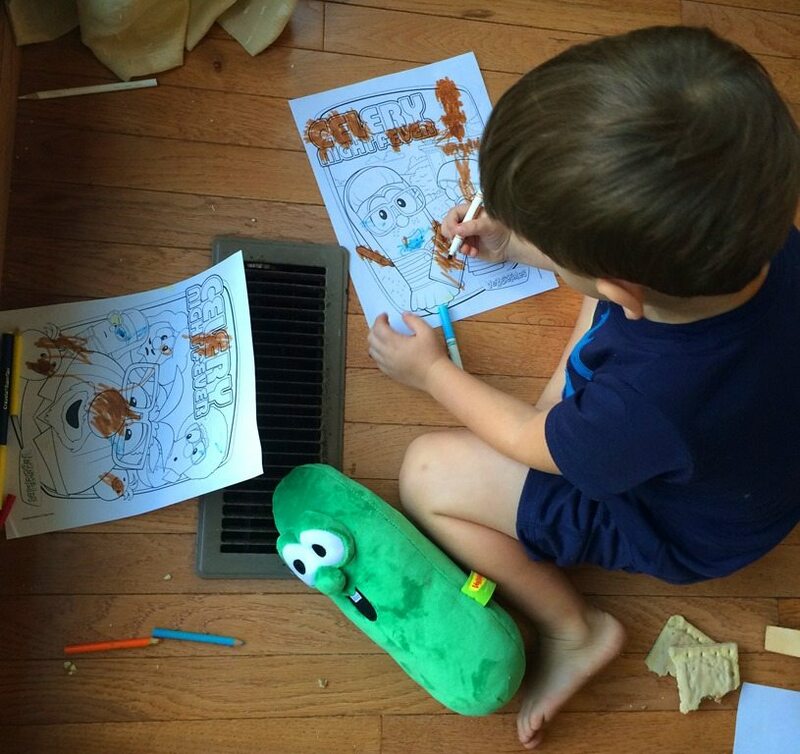 We love so many veggietale movies, it’s hard to choose a favorite but I can tell you our favorite segments are “Silly Songs with Larry” The Cebu song, the Lip Song and my particular favorite My little hairbrush! When I was in college (1996-2000) we would have Veggie Tales watching parties. These are the kind of crazy nights that we would have on a conservative Christian college campus. (This sentence brought to you by the letter C.) Being that I am so old, my favorite is “Where’s God when I’m S-scared?” My 5 y/o’s favorite is the Ballad of Little Joe. Well my Son loves the Jonah veggie tales movie, but that might be due to the extremely catchy First Aide in the First Grade song that plays in the beginning. I love Silly Songs With Larry and my favorite silly song is the Dancing Cucumber song sang in Spanish. We might have watched that in Spanish class a few times ;) oh and my 21 month old calls it Veggie Toes. It’s the cutest thing ever. He loves them and I’m so happy because I discovered them when I was 12 and have been in love ever since. I wish I had gotten to go to that event but your coverage of it is awesome! Love your slide-ins done in theme with the shows ;) glad you had fun! An thanks for the giveaway, that’s so nice of you. I don’t recall ever actually watching Veggie Tales, though I do know several of the songs from my teenage years. Many of my friends at church were super obsessed, and on choir trips the minister of music’s toddler would beg to listen to his Veggie Tales soundtracks, so we all got exposed that way. I remember the theme song, Oh Where is My Hairbrush, and His Cheeseburger, which was my favorite. I think I would like The Wonderful Wizard of Ha’s and Lord of the Beans. I never watched Veggie Tales when I was younger, because I thought they only revolved around bible stories. Now that I have a 2-year-old, I watched one with her not too long ago, and am pleased to add them to her list of things she can watch! They are cute characters with catchy tunes and great messages for kids & adults alike. I like the one with Madame Blueberry….can’t remember the name, though! We love all things veggie tales. We even had a veggie tale birthday party. I made a “Bob” cake. I will need to find a photo to show you. I can’t believe you posted one I have never seen. Wonderful wizard of Ha’s. Goodness! It’s been YEARS ago since I last watched a Veggie Tales. Probably when my oldest grandson was a little shaver. So, that being said, I don’t remember what it was. However, I’d still like to win since I have some great nieces and nephew who would love these! I have only seen snippets of the Veggie Tales movies but I do think they are adorable and would love to have one and become a convert!!!! My fav is Minnesota cuke…..cuz the threat of we Canadians taking I’ve both sides of the Niagara Falls is real, y’all. I love the song DVD’s the best–the cheeseburger song and Hairbrush and The Bunny Song and all of them! 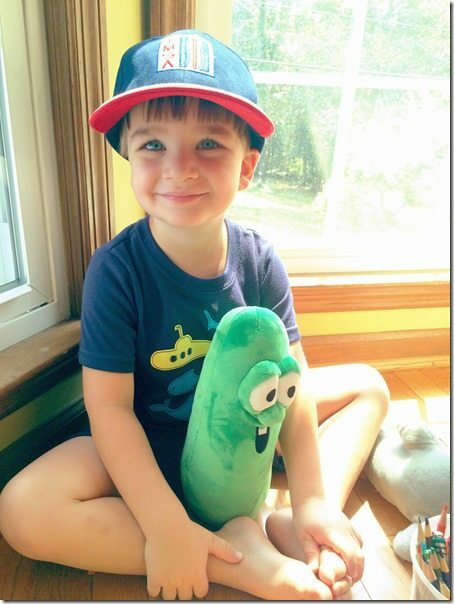 My 2-yr-old just saw his first veggie tales episodes on tv & it’s all he can recite lately. Lol. I haven’t seen any of the movies but I love the silly songs with Larry. So catchy!!! Its awesome that you got to have such a fun trip. Memories of a lifetime! I love Lord of the Beans and King George is a close second. My kids are too old for Veggie Tales now, but I recently added some Silly Songs with Larry onto my iPod along with “real” music and we are really digging them! That’s such a neat opportunity! I have loved veggie tales my whole life too and have stuffed Larry and bob in my closet somewhere. My favorites are Rack, Shack, and Benny or Madame Blueberry but it’s hard to narrow it down even that far! They’re all so good. Lyle the Friendly Viking is probably my favorite. We tend to start singing “Stop right there don’t take another hop…” when we want the kids to stop moving. Thanks for the giveaway! We like the Pirates Who Don’t Do Anything. Because Pirates (and rock people) are cool. I wish I could post pictures here! My little girl had the best Veggie Tales birthday cake last year. We watched only Veggie Tales from 2 1/2 to around 3 1/2 (she’s now 4). My favorite is Saint Nicholas (something about Joyful Giving), and her favorite is Madame Blueberry. I have most of Sweetpea Beauty memorized, too. We have two Veggie cds in the car that I have memorized as well. What’s really great is when I’m in the car by myself and STILL belting them out! Rack, Shack and Benny. They were my first, and hold a special place in my heart. 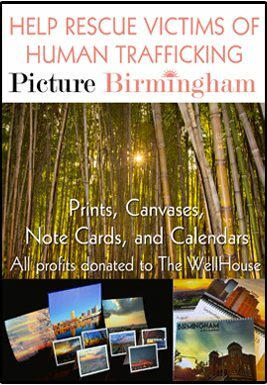 I’d love to win a DVD for my grandchildren. Yeah, that’s my story, for my grandchildren! I want to win!! Me, me, meeee!! I’m so excited they are revamping Veggie Tales… My favorite is Saint Nicholas: A Story of Joyful Giving. 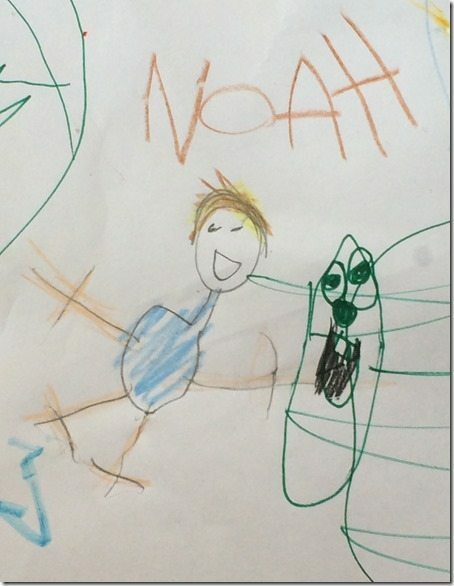 We love the wizard of has and Jonah and the whale! What a fun experience and you’re a cute veggie!! Thanks for the fun giveaway!! I LOVE Rack, Shack and Benny. The chocolate factory song is so catchy. My husband and I don’t have children yet, so he thinks I’m insane for having that song downloaded. My favorite Veggie Tales- is “Where’s God When I’m Scared?” Because, God is bigger than the boogie man. This is so cool and I’m so glad you had fun doing it! Shouldn’t this bloggers media thing have been held in Boston? In the fall? I totally loved Veggies Tales when I was younger and I can’t wait to introduce my son to them when he gets old enough to care! My favorite one was Dave and the Giant Pickle. My favorite character(s) were definitely the green peas! Love them! I thought I was the only one! I have been in love with the Veggies since working at a Christian bookstore in high school, buying all the videos on VHS and then DVD. I had Bob and Larry tshirts and also had the opportunity to BE Bob and Larry when we rented the costumes. I also have the entire collection of Veggie plush! Even a talking Kahlil from Noah, which happens to be my favorite. I have loaned my collection to several families with small children over the years to spread the love of VT, since I do not have children of my own. I greatly enjoy exposing my nieces and nephews to all the Veggie goodness and catchy tunes! However, though college and adult life I have lost touch with the new movies and can’t wait to catch up! This post made me smile so much Rachel! Pretty much any of the earlier ones – particularly those with references to Monty Python’s Search for the Holy Grail! I love Josh and the Big wall and Dave and the Giant pickle the best though- Cant wait to see even more of them- hoping to get a whole collection going eventually for my kids to watch since we dont have much in the way of Christian videos available way way over in Moz! But thankfully we are here in Canada for a few months so maybe we can win one of yours and find a few more at Garage sales or something! My favorite is Madame Blueberry, I adore the narration by the French peas, and the StuffMart song is amazing. We have an Easter Veggie Tale that the girls love. The cheesy songs always get stuck in my head! My favorite is Madame Blueberry and the Stuff Mart.